The presence of recently-crowned FIA World Endurance Champions, BRDC Members Mark Webber and Brendon Hartley, was one of the main highlights of the Club’s Annual Awards at the Grand Connaught Rooms in London’s Covent Garden on 7 December. Porsche’s first world champions since Derek Bell in 1986 received special BRDC Gold Stars from the Club’s President, Derek Warwick, for their achievement and we were delighted that they were joined by their team mate, Timo Bernhard. 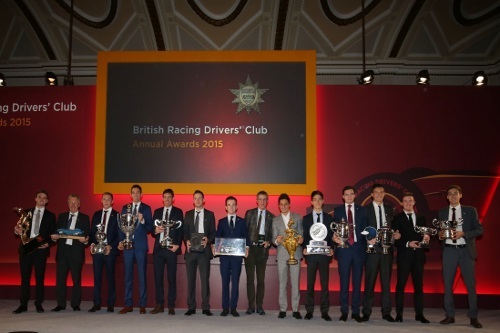 Along with many of the leading lights from British and Commonwealth motor sport, they made the occasion a great success as the Club’s prestigious and historic awards were presented, with the proceedings once again compered by Jake Humphrey. Although Lewis Hamilton had another commitment which prevented him from collecting his two Gold Stars, BTCC star Jason Plato was there to receive the BRDC Silver Star to swell his collection to eight as the Member achieving the most points in the major national championships. Coincidentally Lewis now has eight Gold Stars, exceeded only by Sir Stirling Moss with 10. Another highlight was the presence of the 2015 McLaren Autosport BRDC Young Driver of the Year, Will Palmer, who was still on a high following the announcement at the Autosport Awards the previous evening . Will also collected the newly instigated Jim Clark Trophy as winner of the Duo BRDC Formula 4 championship alongside many high-achieving BRDC Members who have enjoyed outstanding success this year in single seater categories worldwide including Oliver Rowland and Nick Cassidy. Le Mans 24 Hours winner Nick Tandy received a great reception as he was presented with the ACO Plate by the President of the Automobile Club de l’Ouest Pierre Fillon, while young Charlie Robertson, winner last year of the Henry Surtees Award, now received the ERA Club Trophy in recognition of his European Le Mans Series LMP3 championship. Sir Stirling and Lady Moss, Damon Hill, Nigel Mansell, John Surtees, Martin Donnelly and recently announced 2016 Lotus Formula 1 driver, Jolyon Palmer joined over 300 guests for the sparkling event.